In a large bowl, toss the onion, zucchini, peppers and mushrooms together with the KC Masterpiece® Garlic & Herb Marinade. Spread the vegetables in a single layer on parchment-lined baking sheet and roast for 25 minutes or until the vegetables have softened and edges are browned. This can be done a day in advance. On a lightly floured work surface, roll out dough into a 15-inch circle. Brush with 1 tablespoon of the olive oil. Lay dough onto grill, oil side down. Cover and grill over medium coals, about 3 minutes or until dough is puffed and underside is browned. Using tongs, turn pizza over and quickly spread the top with the dressing. Sprinkle the cheese, vegetables and chicken over the dressing and cover. Grill another 2 to 3 minutes or until cheese is melted and underside of pizza is browned. Use tongs to slide onto cutting board. 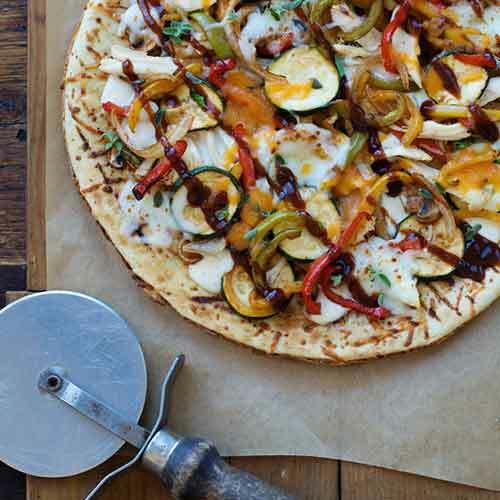 Drizzle the KC Masterpiece® Original Barbecue Sauce on top and sprinkle with the chopped oregano.